Lower back of your body plays a significant role to keep body straight. 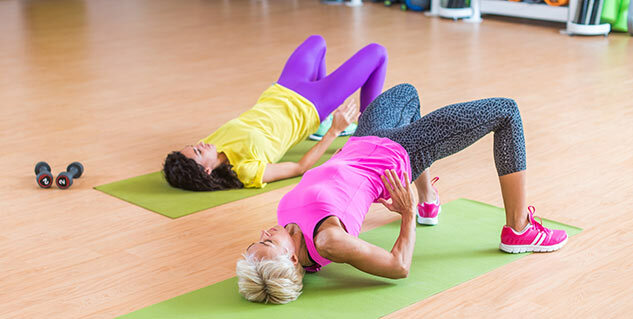 Hip bridge, bird dog and side plank can keep help back strong. These exercise can prove benefitting in rehabilitation. Lower back of your body plays a very significant role in keeping your body straight, give structural support, aid in bodily movements and protect certain body tissues. The function of the lower back is to support the weight of the upper body. Injury or pain to the lower back can be strenuous and problematic. You will need to lie on your back with feet flat and hip-width apart. The arms must be at a relaxed state and the knees bent. You must then squeeze your buttocks as you lift your hips high forming a straight line from the knees to the shoulders. Hold this position for a slow count of two and then, slowly lower the hips. Do at least 10 to 12 repetitions. This exercise counteracts the effects of spending too much time on your chair, which puts excessive pressure on the spine. This exercise stretches your hip flexors and strengthens the muscles that stabilise the spine, including those of the lower back. To do this exercise, you must begin on all fours with your knees hip-width apart and under the hips. Hold your hands flat and shoulder-width apart, then pull your belly toward the spine and squeeze your abs. You must be careful to keep the spine neutral without arching your back or rotating hips and then let your right arm extend while keeping the left arm straight ahead. Hold this position for two to three seconds or as long as it suits you, then repeat five to six times on each side. This exercise particularly helps to improve your muscle balance and coordination, and makes it easier to keep your spine stable for daily movements, such as walking, running, dancing or carrying a child. The exercise also tones your glutes, upper back, lower spine and hamstrings. In a straight line from your head to feet, try and lie on your side by resting on your forearm and making sure that the elbow is directly under your shoulder. Then gently contract your abdominals and lift your hips off the floor, maintaining the line. You must strive to keep your hips square and your neck in line with your spine. Hold this position for 20 to 40 seconds and return to the starting position. Repeat two to three times by changing sides. This exercise will help you to build strength and endurance at the core. Moreover, this will help you to keep your lower back protected and stable while you are doing something that requires a lot of movement of the hips or back.